In this tutorial we'll discuss why and how to create your own banner advertisements. If you already have banners and simply want to display these banners on your web site(s), please see our other tutorial: How To Display Banners. We'll begin by discussing the reasons why you might want to create banner advertisements. There are several different file formats that you can use for creating banners, in this chapter, we'll look at the advantages and disadvantages of each. Next we'll discuss goals in designing banners. In other words, what makes a good banner? The most common way (but not necessarily the easiest) way to create banners is to use a painting or drawing program. In this chapter, we'll look at specialist programs which are intended just for creating banners. 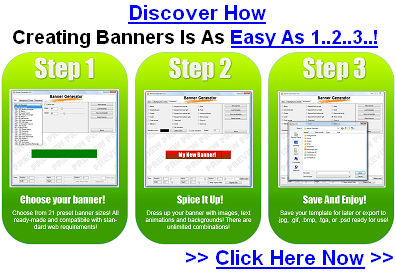 Finally, we'll look at some online tools that can create banners for you. Self-contained program for creating banners. Self-contained program for creating professional-quality banners. Adobe Photoshop (also compatible with Photoshop Elements) templates for creating banners.